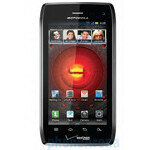 Verizon has yet to introduce the Motorola DROID 4, but with all of the leaked pictures and specs, it is obviously coming soon. In fact, the latest speculation calls for a February 2nd launch of the phone. And even though there has been no announcement regarding the model, TechnoBuffalo was able to get its hands on the dummy version of the DROID 4 that is used to let potential buyers get an idea of the dimensions of the phone and to make sure that it fits well in the hand. The 4G LTE logo on the back of the phone tells us that the Motorola DROID 4 will indeed have 4G connectivity. The other expected specs include a 4 inch qHD screen which matches the screen on the Motorola DROID 3. Under the hood will be a 1.2GHz dual-core processor, slightly faster than the previous models' 1GHz dual-core processor. With its 1GB of RAM double the 512MB on the DROID 3, the DROID 4 will have an easier time with multitasking and with the general responsiveness of the unit. The 16GB of native storage is the same as found in the previous Motorola DROID as is the 8MP camera capturing 1080p video. The front facing camera is improved to HD for sharper video chat and self portraits. The 1540mAh battery found in the DROID 3 is replaced with a 1785mAh cell. The Motorola DROID series will always have a place in the heart of many Verizon customers as the original generation model gave them a handset that could compete with the Apple iPhone before Big Red was able to offer Apple's touchscreen handset. It seems so long ago now that the DROID 4 is coming, but the first Android 2.0 powered handset was so different from anything that Verizon customers had seen before (consider the carrier's previous iPhone killers like the LG Voyager and the BlackBerry Storm). It is hard to believe that it was only two years ago that the DROID was named Time Magazine's Gadget of The Year, beating out the Apple iPhone 3GS. wow, i like how it has the sort of octagonal edges like the razr.. i'm not a fan of motorola at all but they do have a pretty good design team. I am sure it is coming for it. But I will be surprised if ICS is the standard before the summer selling season. I'm looking forward to the first couple weeks of reviews after its released. I'd like this to be my next phone, but I have reservations. Take this POS along with the bionic, evo 3d, razr, and that new POS nexus and put it in the garbage because thats what they are. LAGGY and full of problems. hah, good one... have u even tried them out yet? Nah. garbage is just a garbage troll. Maybe I'm nitpicking, but I'm kind of curious why they say 1GB "nearly" doubles 512MB when it exactly doubles it... or am I missing something? you didn't do so great at math when you were in school did you? Or Engrish for that matter. 1gb of ram is always 1024mb equivalent. Why would anyone thumbs down angusNG12345 comment? 1gb IS 1024 mb. It just is...what's there to thumbs down about that?.....? I was taking college classes my Junior year. By the way, they fixed the article. Go reread it. I hope this is the monster device those who want physical keyboards deserve. My Daughter owns the Captivate Glide on AT&T and it is a very good phone except for the keyboard, which is flat keyed and just bland in it's design and function. There is still a large demand for QWERTY love, and this could cater to them. This bad boy was so on my radar. I really was blown away by the RAZR and it's performance, and I liked both the Photon on Sprint and the original Atrix on AT&T (never played with the Atrix 2). And I loved the Droid 3. I am a huge Motorola fan these days. I am cheering for it. ICS is only for the galaxy nexus for the time being. Dont worry this will get ics down the road. i think that if the Feb launch stays true this will probably have ICS preloaded as all Droids in the original lineage have always had the latest version of Android out of the box. My only complaint on the Droid 3 is the camera quality. Megapixels mean nothing when the pictures have odd looking color tones. Hopefully that is improved with the Droid 4. Since I don't live in a 4G area, I probably won't be getting the Droid 4 unless something happens to either my Droid 2 or Droid 3. Droid 5 (if they make it) will probably be out around the time I get 4G and my Droid 2 is eligible for upgade. the weird picture color tones was fixed with an update. I didn't know that. That's why you're the King! Ironically though, after my post, my wife's Droid 2 started having serious problems. Guess I'll probably be getting the Droid 4 after all. So glad I have the RAZR - why would anyone choose this phone (if specs are true) over a RAZR? Besides having an actual keyboard. It's simple. Some people just prefer Qwerty kybd phones over a regular one. I have big hands and for someone like me, a qwerty kybd is the way to go. I can type much faster on a kybd than I can on a virtual kybd. It's all about preference. @networkdood - I agree completely. However, I understand the part about needing a keyboard. Until July, 2010, I was a BB owner because of the keyboard. I finally got fed up enough with RIM that I decided to try an Android phone without a keyboard and went with the X. By September, I had migrated completely to the X and haven't looked back. But I can understand the reluctance to give up a keyboard. For those who are dependent on a physical keyboard, the D4 gives them close to the RAZR in screen size, while having the same specs (CPU, RAM, display resolution, etc.) and they get to have a good keyboard as well. They are just wishing VZW would release the D4 now instead of in February.